On Sale Now! Save 10% on the StarTech.com 1 Port to 4 Port VDSL2 Ethernet Extender Kit Over Single-Pair LAN Network Extender(410VDSLEXT2) by StarTech at The Square SC. MPN: 410VDSLEXT2. Hurry! Limited time offer. Offer valid only while supplies last. The 1-port to 4-port VDSL2 Ethernet extender kit lets you connect up to 4 remote network segments or devices to your network, using RJ11 phone cable. The 1-port to 4-port VDSL2 Ethernet extender kit lets you connect up to 4 remote network segments or devices to your network, using RJ11 phone cable. This VDSL2 extender is easy to use and integrates a 4-port Ethernet switch on the receiver unit, which reduces the expense of purchasing additional network switches or routers. Span your network, even across long distances The extender reduces the hassle of networking your isolated devices or server rooms by overcoming the 330ft (100m) distance limitations of common Cat Ethernet cable. It's perfect for connecting remote IP cameras or user workstations using single-pair copper wire such as telephone cable. The versatile extender spans your network at distances up to 3300ft (1000m) at 40Mbps, or 1000ft (300m) at 100Mbps throughput. Save your money, use with existing infrastructure With a built-in Ethernet switch, you don't have to purchase additional networking equipment at the remote location. Plus, you can deliver network access across the existing phone line infrastructure for added cost savings, or simply use a single point-to-point RJ11 cable. The extender is ideal for networking separate buildings at the same location, or for use in older buildings that only have plain old telephone service (POTS). 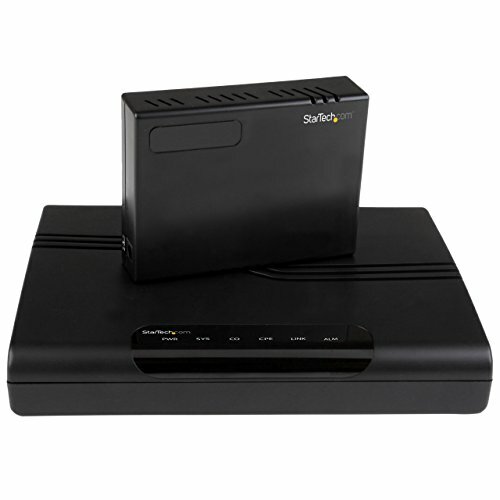 It gives you more network connectivity in locations where standard Cat wired or wireless access is unavailable or unreliable. Suits your needs, right out-of-the box This extender kit is the perfect all-in-one extension solution. With an integrated DIP switch as well as web-based customization, you have all the tools needed for simple yet effective network extension and management. The web-interface lets you tweak settings, and to get you up and running quickly there's no driver or software installation required. The 410VDSLEXT2 is backed by a StarTech.com 2-year warranty and free lifetime technical support.